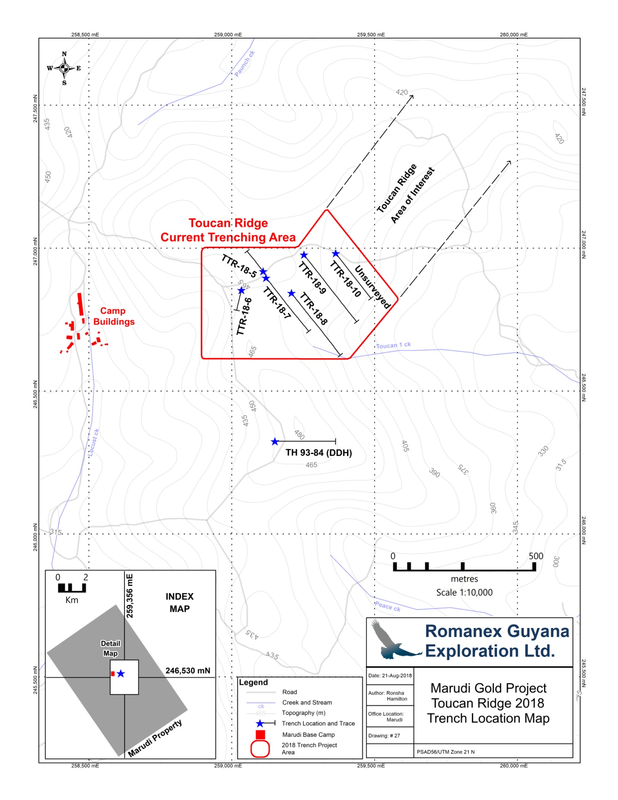 October 23, 2018 / TheNewswire / Vancouver, Canada - Guyana Goldstrike Inc. (the "Company" or "Guyana Goldstrike") (TSXV: GYA, OTC: GYNAF, FSE:1ZT) is pleased to report assay results from Trench TTR-18-9 at the Toucan Ridge area on its Marudi Gold Project ("Marudi" or the "Property") located in the Guiana Gold Belt, Guyana, South America. 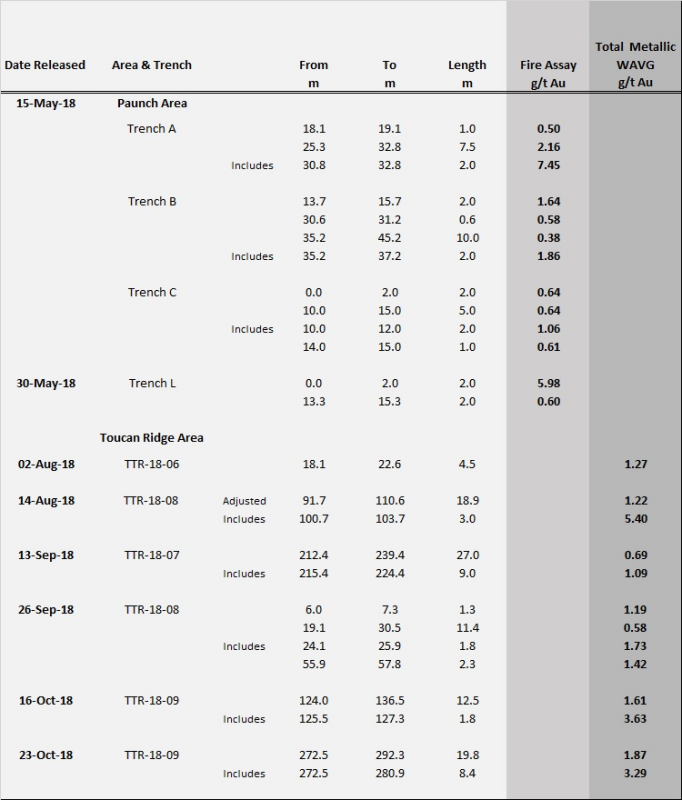 Trench TTR-18-9 assays returned 3.29 g/t Au over 8.40 metres within 19.80 metres of 1.87 g/t Au. The trench is located approximately 300 metres eastward of trench TTR-18-06 along Toucan Ridge. In total, 298.30 metres has been excavated, sampled and mapped. The results represent the final assays from trench TTR-18-09; additional assays are pending from Toucan Ridge trenches TTR-18-07 and TTR-18-08 and will be released once received and reviewed by the Company. Please see below a table of all trenching results to date "Table of Significant Gold Assay Results to Date" and a map of the Toucan Ridge area of interest and trench locations "Toucan Ridge Location Map". "We continue to be very pleased with our trenching at Toucan Ridge. Trench TTR-18-09 results have confirmed good grades with significant interval lengths which are consistent with results received from previous trenching performed on the ridge this summer. The technical team will continue to step out and trench along the ridge's current 1.75 kilometre-long area of interest. We also look forward to the results of the recently completed airborne magnetic and radiometric survey that was performed over the entire 13,500 acre property. The survey will assist in further defining our current trenching targets and drill targets for our planned 2019 drill program." A total of 1112 metres of trenching has been completed in the Toucan Ridge area of the Marudi Property. 390 samples have been taken. The exploration team will continue along the ridge progressing in an eastward direction with each new trench site stepping out roughly in 100 metre intervals, mainly perpendicular to the ridge. The area of interest continues for more than 1.75 kilometres to the east of trench - TTR-18-06. Trench sites are planned where quartzite-metachert is exposed or interpreted to occur beneath the transported overburden. The eastern part of Toucan Ridge is approximately 400 metres south of the Paunch area which was trenched in May and returned the Company's first significant gold discovery. Locke Goldsmith, M.Sc., P. Eng, P. Geo, Chief Geologist and Exploration Manager for the Company, is a Qualified Person in accordance with National Instrument 43-101 - Standards of Disclosure for MineralProjects. Mr. Goldsmith has reviewed and approved the scientific and technical content of this news release.